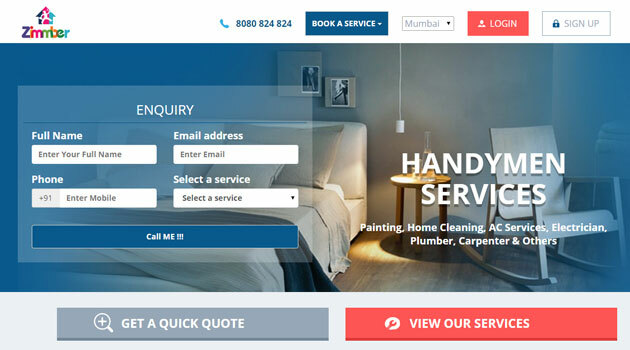 Mumbai-based Rejuvenate Solutions Pvt Ltd, which owns on-demand home services platform Zimmber, has secured $400,000 (Rs 2.5 crore) in a fresh round of funding from top officials at mobile ad network InMobi. InMobi's co-founders Naveen Tewari, Mohit Saxena and Amit Gupta, along with its vice-president of finance Manish Dugar and chief product officer Piyush Shah participated in the investment round, as per a press statement. Zimmber has also acqui-hired Dhulai, a Mumbai-based start-up that provides laundry services for an undisclosed amount. Acqui-hire refers to the buy-out of a company primarily for the skills and expertise of its staff, rather than for its products or services. "Investments from...businesses such as InMobi endorse our capabilities and help us in adding value as a technology firm. Also, acqui-hiring Dhulai, helps in streamlining our supply side as our demand rises. At present, we are getting 100 orders per day from cities including Mumbai, Pune and Gurgaon," Anubhab Goel, CEO and co-founder, Zimmber, said. Founded in October 2014 by Amit Kumar (co-founder and COO), Gaurav Shrivastava (co-founder and CTO), and Anubhab Goel (co-founder and CEO), Zimmber is a marketplace that specialises in services such as fixing a dripping flush tank, rectifying an electrical glitch, or installing an air-conditioner. The startup, which launched its mobile app earlier this year, currently operates in Mumbai, Delhi, Pune, Gurgaon and Thane. It claims to have over 400 service providers on its platform. Previously, Zimmber had raised about $500,000 in funding from a group of angel investors, including Pavan Sinha, co founder and Managing Director of Jabong. Tewari said, "Zimmber is solving a real life problem we all face each day. We believe in the model and team and would continue to back Zimmber." Founded in September 2013, Dhulai allows the customers to place an order for laundry on one's phone and tablet. Pickup and drop-off times can also be scheduled. The company claims that it will deliver clothes within 48-72 hours in reusable non-plastic bags.
" Laundry segment is not an organised space. We started Dhulai keeping the same vision; however with advent of new local home services providers, we see it as a shared vision. We will ensure that this category become the leading one for Zimmber," Dhulai's founder Henal Salian said. Dhulai's 10-member team will join Zimmber to lead its new laundry section. Today, Zimmber's rival UrbanClap also said it also received a funding of $10 million from SAIF Partners and Accel Partners. Hyperlocal services marketplace attracted a lot of investors this year. Other companies which raised funding include LocalOye (Tiger Global and Lightspeed), Qyk (Zishaan Hayath, co-founder, Toppr.com; Abhishek Goyal, co-founder, Tracxn.com; and Delhivery co-founder Sahil Barua), Near.in (led by Anupam Mittal, CEO of People Group, and Manish Vij of Smile Vun Group), FindYahan (led by Karan Bajwa, managing director of Microsoft India), TaskBob (Orios Venture Partners & Mayfield India) and UrbanPro.com (Nirvana Venture). Till recently, the fragmented and unorganised local services market was being served through local business listing firms such as Just Dial. In that model, users received phone numbers and also got direct calls from professionals/service providers after they posted their requirements.